Oh how I love bunnies! I researched the symbolic meaning of bunnies and found they stand for abundance, comfort, and vulnerability. Now I understand why I love bunnies, I’m surrounded by an abundance of love from my six granddaughters and family. 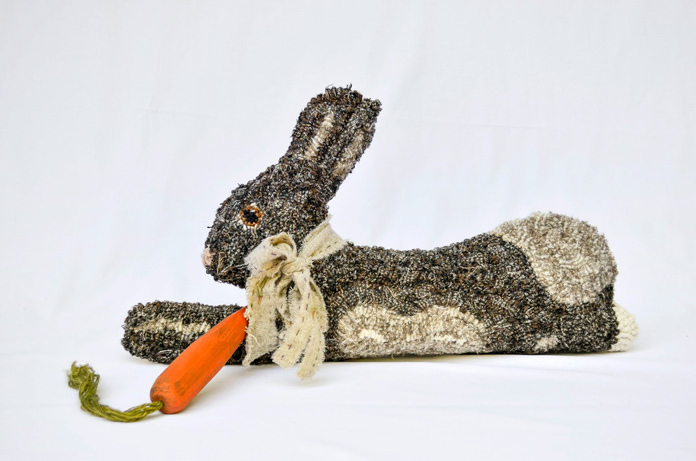 Bunnies do provide me with comfort, yet when I show my work to others I feel very vulnerable. Let me introduce Harriet and Basil. These are based on a Betsy Reed rabbit design from Heavens to Betsy and I was inspired to hook these bunnies when I took a class with Loree Lennox of Primitive Past Tyme. I was so excited to make Harriet I kept adding more little playful additions to her. Harriet and Basil are both made the same way, where it’s hooked on one side and patchwork applied to the other. They are both 26″ long, 3” larger all around than the Betsy Reed rabbit.